When I started freelancing I had no idea what I was doing. I studied design in university and had a couple of years of experience but I never learned how to survive by myself in the real world. Today, after almost 5 years working as a freelancer (whew, has it been that long?! ), I’m still learning new things everyday but this journey taught me a few lessons that I wish I’d known from the very start. These are a couple of things I learned working as a freelancer that can hopefully help you avoid some mistakes I’ve made in the past. This one might seem obvious but when you’re just starting out it’s natural to undervalue your work and time. You might be tempted to accept a project for a very low fee or just for exposure but it’s important to remember that every second you put into a project (from replying to emails to sketching) will end up adding value to whoever you’re working for. There’s no need to feel guilty when asking for money because you are providing a service to a person/company and you’re ultimately helping them achieve a goal. Exposure will not help you pay the bills or put food on the table. With this I’m not saying you shouldn’t accept pro bono projects. I’ve done it in the past and still do it when I relate to the cause or the person I’m working with. It’s easy to turn your work-mode off when you have a regular 9 to 5 job. You come home from the office and usually you don’t need to think about it until the next day. That’s not the case for freelancers. We have a very flexible schedule which has it’s perks but also can work against you. We never know when work is coming so it’s natural to feel that we always need to be available for a last minute gig or for an urgent revision on a project we worked on. You don’t. It’s super important to balance and distinguish your work from personal life and to give yourself the freedom to not be tied to work all the time. This is even more relevant if you’re working from home because the place you relax is also the place your business is which makes things more difficult to separate. Of course there are going to be busier times than others but you shouldn’t feel guilty for not working all the time. One of the things I learned early in my career is that sharing your work is the most natural way to find new clients. How are people supposed to know you exist and are available if you keep your work a secret? I know it can be intimidating to put yourself out there. There are so many people doing great work and sharing it constantly so why would anyone care about another designer? That’s the wrong way to think. You don’t need an audience of 50.000 people for your work to matter. Design is something that is needed everyday and there are tons of people out there looking for someone to design their logo, flyer or banner. You just need to start sharing what you do to let people know about your talent. Another great thing you can do is to show your process instead of just sharing the final piece. Most of the people love to know how things are created and it’s great for potential clients to have an insight on how your process is. Writing is also a great option. I’m guilty of not using this blog as much as I intended to, but I realised that blogging is a great way to generate traffic to your website. There are so many websites where you can post your work. Personally I use Behance, Dribbble and Instagram but there are a lot more options available for any creative field. It’s great when a new client reaches out for work but that doesn’t necessarily mean you’re the right fit for it. My work focuses mainly on lettering, illustration and branding but sometimes I get inquiries do to projects where I know I’ll not only not be the right fit but also won’t have fun working on it. It’s important to be honest with yourself and the client when this happens. It might be tempting to accept all the projects that come your way but in the end you’ll end up with work you’re not proud of and didn’t enjoy creating. Clients always appreciate your honesty when you say “no” and from experience a lot of times they end up coming back in the future with a project that’s more suited to you. I’m not saying that you shouldn’t accept projects that are outside of your comfort zone. If you feel that you can handle a project that’s outside of your comfort by all means accept it. Those are the best and will help you grow your confidence and skills. Even though working for clients is great, most of the times you’re limited to someone else’s vision. As creatives we have a lot to say and we don’t always have the chance to use our voice because the final product depends on the approval of someone. Let’s say you love to work on packaging but those briefs never end up coming your way. Maybe that’s because you don’t have enough packaging projects on your portfolio. Personal projects are great vehicles to show potential clients what you can do and I can say without any doubt that most of my client’s interest in me come from my personal projects. Whenever I have free time I like to get my hands dirty and create something on my own just for fun. Find something that interests you and try to explore it in your own way. They’re a great way to find new techniques and to improve your skills. If you always wanted to learn a specific thing create a project around that area and force yourself to figure it out. These are just some of the lessons I learned during these years. I’m by no means an expert and I feel that there’s still so much more to learn but I hope this provided some value to you. 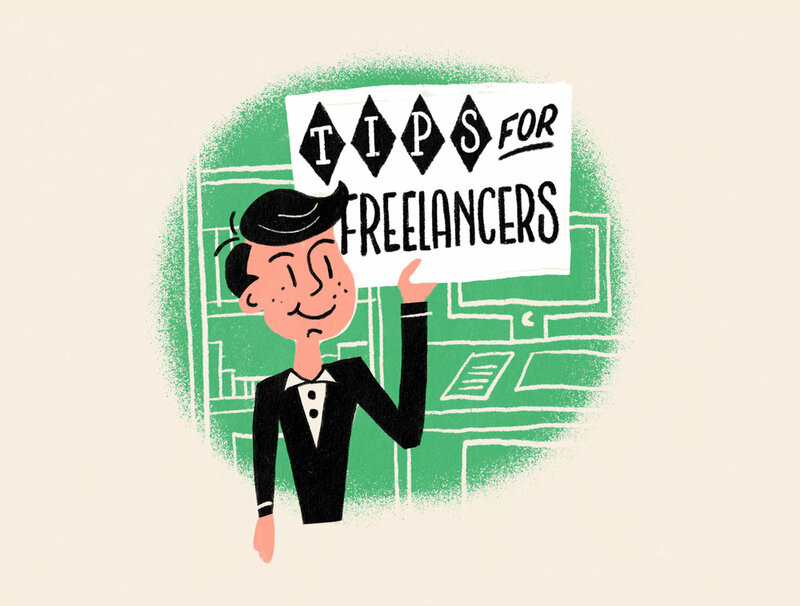 Feel free to comment with questions or insights regarding freelancing!